Build a house for orchard mason bees, the gentle natives that are super-efficient pollinators. Or even better, enlist a kid and sign up as a team to build one. In this class, you will learn about these amazing bees, their needs and what makes them so much fun to raise. Unlike honeybees, which are not native to North America, orchard mason bees do not have the social structure of a hive, so there is no need for them to aggressively protect one. Thus, there is very little chance of getting stung. But the bees still pollinate flowers, so encouraging them is one way to ensure a bountiful crop of apples, plums and other treats. Working with mostly pre-cut parts, you will construct a cute cedar hut that shelters trays with grooves that fit parchment tubes, which you will also learn to make. The mother bees go into the tubes to lay their eggs and leave little packets of food. As the eggs hatch, the larvae grow and eventually create cocoons to protect the pupae until they hatch the following spring, starting the cycle over again. Open to anyone 8 years old and older, but those younger than 14 must be accompanied by an adult. 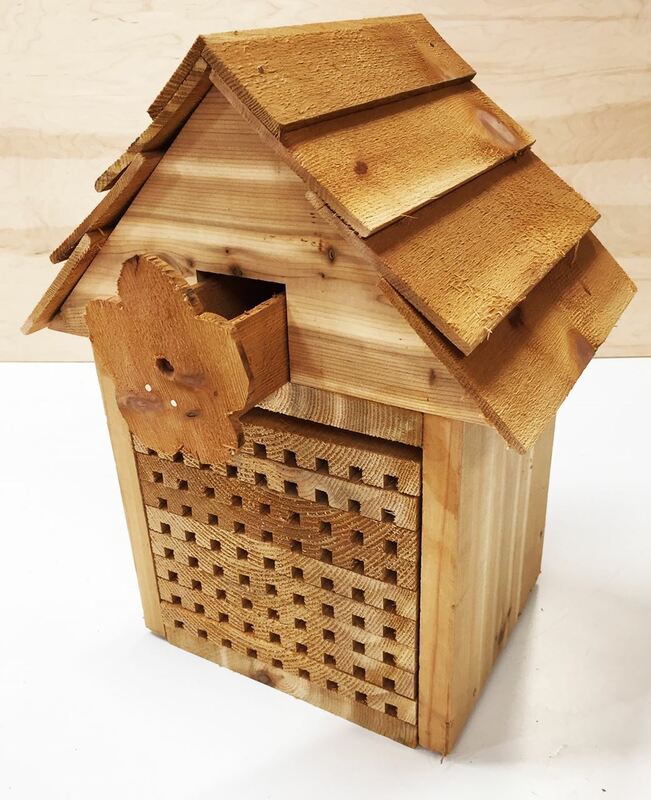 For a child/adult team, please register as one person and plan on building one bee house. In October, you will be invited to a session where you can learn how to harvest the cocoons. clean off any pollen mites, and safely store the cocoons until spring, when you will need to place them in the release box — that cute drawer-like feature just under the roof, which you will also build on the first day of this class. The date of this activity will be emailed to class participants later. If you cannot make the scheduled date, we will email you the information. Instructor: Josh Haza. Josh has been building furniture for his home and doing home renovations for a few decades now. He also built equipment for high school physics classes he taught. Close-toe comfortable shoes are required.